Seregil of Rhiminee has reviewed Christopher Nuttall’s fourth and final book in the Bookworm series, Bookworm IV: Full Circle, on the Risingshadow website. Describing it as “fluently written fantasy entertainment at its best” he starts by saying that “Christopher Nuttall is one of the few authors who write consistently good entertainment”, writing fascinating and “captivating stories filled with interesting characters, good ideas and plot twists”. 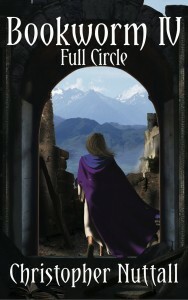 Seregil’s conclusion is that for readers who enjoy fantasy, Bookworm IV: Full Circle “will provide fascinating entertainment”, going on to say that “It’s one of the best novels of its kind, because it features plenty of action, magic and plot twists”. He finishes by saying that “you can’t go wrong by reading this novel and its predecessors”.